I recently introduced arrowroot flour into my diet and it seems to agree with me… and I agree with it! Up until now, the baked good recipes here called for coconut flour, since I’m not a fan of baking with almond flour or other nut/seed flours due to the anti-nutrient properties. Browsing the recipes on my site, you may be under the impression that I consume grain-free baked goods on a regular basis. Although I enjoy crafting healthy recipes suitable for restricted diets (because I know that baked goods are a welcome addition when you have limited food options), I only make baked goods occasionally. Baked goods and treats, even when made with healthy flours such as arrowroot or coconut flour, should still be kept in moderation. 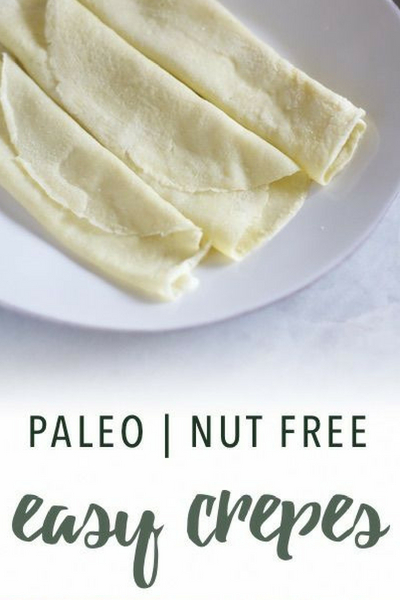 These paleo crepes are a delicious and versatile tortilla or wrap substitute. The arrowroot flour makes these perfectly pliable and flexible – you can bend, roll and fold them without any tearing or breakage. They work for sweet dishes – fresh berries and whipped coconut cream would be delightful with these crepes! Alternatively, they make excellent sandwich wraps. These store well and I’ve kept them for a few days in an airtight container in the fridge. They freeze well, too. Make sure to separate each crepe with a layer of parchment or waxed paper before freezing in an airtight container. Arrowroot flour – also called arrowroot starch, it is a fine powder with the texture of cornstarch. Made from the roots of the arrowroot plant, it is an easily digestible starch and often better tolerated than tapioca starch, which shares similar cooking properties. 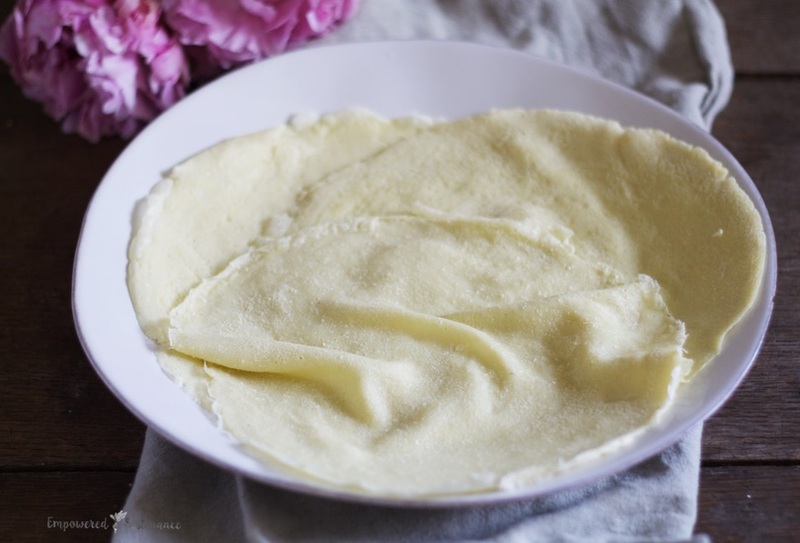 Arrowroot is often used to thicken sauces and gravies, but it also makes excellent paleo crepes. You can find arrowroot flour here or at your local health food store. Eggs – Egg substitutes will not work in this recipe. If you want an egg-free baked good, try my Paleo Plantain Bread or Spice Cookies. Coconut oil – the coconut oil needs to be liquified before adding to the batter. Just melt it over low heat until it is liquid but not hot. Alternatively, you could use avocado oil or olive oil. I prefer not to heat the latter oils because they are not as heat-stable as coconut oil, but it works in a pinch. 1 cup milk of choice. If using full-fat canned coconut milk, use ½ cup coconut milk and ½ cup water. Whisk together all ingredients to create a watery batter. Alternatively, place everything in a blender and blend until smooth. Get your workstation ready. Start heating up your pan, and 8 to 10 inch skillet, over medium-low heat and preheat it for at least 3 minutes so the first crepe cooks evenly. You'll also need some coconut oil for greasing the pan, plus a paper towel or pastry brush so you can brush the pan with oil. To make the crepes, first brush a thin layer of oil on the pan. Then, use a measuring cup to pour about 3 Tbs. of batter into the pan (I use a ¼ cup measure for this). Quickly tilt the pan around so the batter spreads. Working quickly, use the back of a spoon to spread the batter around into any bare spots on the pan. If this is your first time making crepes, don't worry - there is a slight learning curve. Once you get the hang of it, it's a piece of cake! Cook the crepe for about 30 seconds on the first side, until barely golden and dry.The easiest way to flip the crepe is with your fingers. It doesn't hurt if you do it quickly 🙂 Loosen the edge of the crepe with a fork/spatula and make sure the crepe is not sticking anywhere on the pan. Then use your thumb and forefinger on both hands to hold the edge of the crepe and quickly flip it over. Cook for about 30 seconds on the second side, until done. These look amazing! I am trying to get my insides to stop fighting me and suspect possible Celiacs I have had digestive issues all my life. I saw some information (https://www.drlam.com/blog/microbiome-gut-flora/23823/) that seems to point to bacterial balance issues. If its that, i still have to re-align my eating to help fix this… Thanks for another idea for a food i can eat! Look forward to trying these. A quick bit of research claims that arrowroot is high in nutrition and good for gut disorders. Will read your story in a mo. I am managing hashimoto’s and hypoglycemia, so the might be very nice addition to my boring diet. Thanks. Can you substitute cassava flour for the arrowroot flour? I used to use your recipe, and I see it is now changed! I did not write it down and I loved it the old way too. Can you please email me the old recipe, or post the old recipe as well? Much appreciated. I tried the recipe but had to add more coconut flour as the first crepe I fried it turned out too thin. My family and I enjoyed it. Hello. The links for the coconut flour, arrowroot (and I saw chocolate chips in the brownies) go to an error page. could you please type the brands? Maybe cause im from outside the US. Thank you!